Lawn Kitty For Your ‘Kitty To Play With’ Or Is It For Interior Decoration!? A cute looking mischievous kitty is always a perfect mate for every PETA lovers! If you have pet lovers in your family or yourself a die-hard PETA, “man this is the thing you want in your home!” A housewarming occasion or is it your mom feeling blue for losing her favorite kitty!? Ti’s a best gift for her man in this Christmas! Sneak out in the garden and keep it in the backyard to give the old lady a surprise! What!??? Worried about your pet at home who remains all day long in your room all alone? Duh! 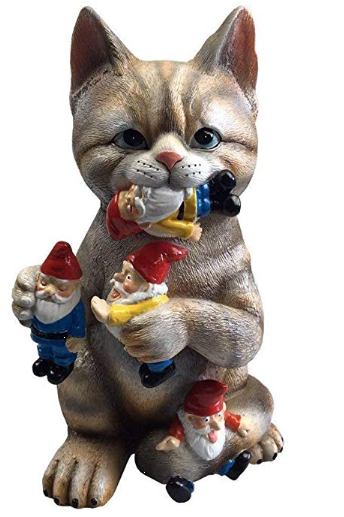 !Chuck that and get a mischievous garden gnome cat statue and give your lill’e buddy the best playmate of the whole world. Beautifully hand painted resin cat like this befits everywhere in your house and even you can try this funny looking cute gnome mischievous cat as a perfect interior decoration item also!